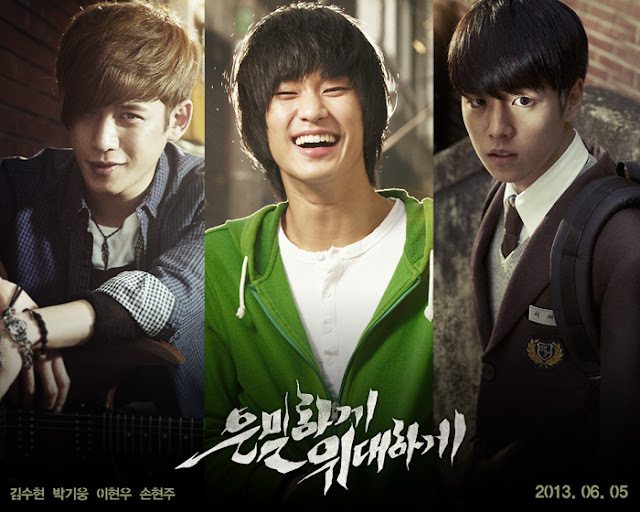 Our journey stopped at Kim Soo Hyun's Secretly Greatly Korean Movie. It was a great experience we enjoyed it a lot. It was spy thriller movie full of action and suspense. The story revolves around Won Ryu a North Korean Soldier who was sent to south korea as a spy. He was an elite team member who knew more than five languages. But lived in a disguise as a clumsy foolish man. We enjoyed Kim Soo Hyun character in the movie. Due to his foolish and irresponsible act he look like the idiot of the century. Some time he fell badly from the stairs and some times got hit by the naughty children while playing with them. He used to wander in the town and when you look at him closely you can see scars on his face and body. Other than he always beaten up by the girl's brother. We even impressed by the story of the soldiers and also how spy's work and risk their lives. The movie was still unpredictable what will be the end, but we were watching holding our breaths. There were many scenes which divert you attention and make you smile with the humorous act of Kim Soo Hyun. When he licked the egg white. Though we watched many action, fit fight, sword fight martial art and spy movies, but secretly greatly is one of its kind. There were many complications in understanding the main story. But we mange our curiosity. The story moves further when he recognized another man from his unit Lee Hae-Rang (Park Ki Woong) who was wearing in a disguise in a rockstar. The mystry isn't solve yet why he was here in the town another young many appear from his unit Ri Hae Jin (Lee Hyun Woo). Won follows this newcomer with the view that Lee knows something he doesn't, has some sort of special mission he hasn't been privy to, though it turns out that Lee is really just as clueless as he is. Now we guess all that intense curiosity was about power. It is a bit if a shock to realize the man under the disguise is still lethal and deadly serious. Kim Soo-hyun we watched him in Dream High & Moon That Embraces The Sun, was un doubtly impressive and this movie proves him to be an outstanding versatile actor. Finally it was the last part of the movie for which we were anxiously waiting. The end was unexpected for us they were betrayed by their seniors. Did we mention something about the micro chip opz we forgot, the senior installed the microchip in their body and every time easily locate their position what, when, where they are moving and doing something. The last scene was full of action. Won Ryu transformed himself in a lethal weapon in mere moments to save other unit members. It was too tense watching him fight like that and even more unexpectedly it look like a violent revenge thriller movie. The three boys react quite differently to this situation and made us feel emotional, sympathetic and angry. We prefer if the end would be happy living after. But not every movie had a positive ending. We recommend you to watch this movie. Its all till now let meet again with the hit or jackpot.